Well, in spite of all the procrastinating, my taxes are done. I do not owe anything. Maybe next year I will be organized enough to get them done earlier. I have two sons. One looks like me. even to being over weight. He and his wife have one baby girl just over a year old. The other son, Jessica’s dad looks like his mother, including the slim build. 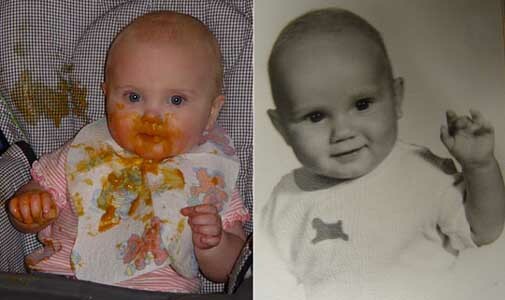 Look at the comparison picture above can you see the similarities between the new baby and the 1940’s baby picture? The baby on the right is not Grandma’s baby picture. It is a picture of Grandpa. Yes, that is me as a baby. I look at those pictures and think that we could be twins. I am going to a radio station event tomorrow. A realtor is having an event that our country station will be promoting on the air. They are having a barbecue lunch and will be giving away a Mexican cruise. This is about an hour away in the same city where I won the 2004 Cavalier. While there I will take a lot of pictures for practice and who knows, maybe the event sponsor would like a picture or two of the event. If nothing else, we will get out and have a free lunch. Some of the event BBQs are hamburgers and hot dogs, but some are tri-tip.